I can finally say that I have been to Korea after my long awaited grad trip there that I've counted down since a year ago!! We were there for a total of 8 days, all of which were spent in Seoul. We booked our flights with Singapore Airlines in September last year since they were having some promotions which came up to around $685 (round trip) per pax. For convenience, we lodged at Boa Guesthouse throughout our entire trip. 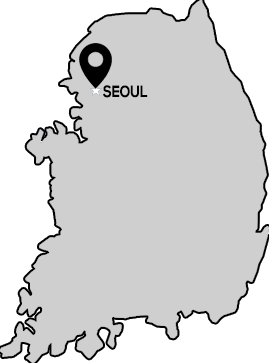 Located just minutes away from the main Hongdae area and Hongik University Station, it was really easy to get around from there. + Direct train from Incheon Airport. Reduce our trouble of lugging our huge luggages around. I was totally unprepared for such temperature so I was freezing away especially at night when the wind came. Gosh. Subways are the most convenient method of transport. I used the Seoul City Pass Plus which includes some tourist benefits. What's traveling without visiting the typical tourist attractions right? Shopping is available almost everywhere at any time! The opening hours varies a lot for different areas though so remember to do your research first. Bargaining is possible at most of the places I went to but not every store owner is receptive to it. Some places that I personally really enjoyed were Ehwa Woman's University, Midnight shopping at Dongdaemun, etc. We ate to our hearts content with at least 4 meals every single day, I'm not even kidding. Korean BBQ Buffet, 부대찌개 (Army Stew), 삼계탕 (Ginseng Chicken Soup), 자장면 (Black Bean Noodles), Seafood, Street Food, Dessert, etc. Korea, you have been really awesome throughout my entire trip and I'll definitely be back for more. I will be posting my travelogue really soon so do keep a look out for them!